Mitch Trubisky threw for only 165 yards and one touchdown with two interceptions, but he did add another 45 yards on the ground and kept the chains moving enough throughout the game to help the Bears slowly beat the Vikings with long methodical drives rather than any big play on offense. Taylor Gabriel caught seven of the nine passes thrown his way for 52 yards, and four of those went for first downs. The Bears’ offense use of misdirection helped Gabriel get open and make plays. Akiem Hicks was perhaps the most impressive performer for the Bears’ defense. He was unblockable in the run game and recorded five tackles for loss. Hicks also produced rushing the passer, recording two quarterback hits and a sack. Khalil Mack had another strong performance in prime time, forcing a fumble and recording a sack, giving him four on the season. Safety Eddie Jackson continued his strong sophomore campaign, intercepting Kirk Cousins for a pick-six in the third quarter. Eric Kendricks recorded 12 tackles, but he struggled to get off blocks, as Cody Whitehair moved the Vikings linebacker often at the second level. Cousins struggled against pressure throughout most of the night and was neutralized until the fourth quarter by a stout Bears defense. He ended with 262 yards on 46 attempts, but a large percentage of those yards came late in the fourth quarter when Chicago was playing soft coverage. The Vikings’ offensive line had their hands full trying to contain Mack and Hicks, as Cousins was pressured all evening. The line didn’t fare much better in the run game, as they struggled to move defenders and the offense ended with 14 carries for just 22 yards. The Bears’ offense won time of possession and recorded 50 percent on third down, as the Bears had to move the ball slowly up-field and take long drives to beat the Vikings. The Vikings’ offense struggled to sustain drives in the first half and played catch up most of the second half because of it. 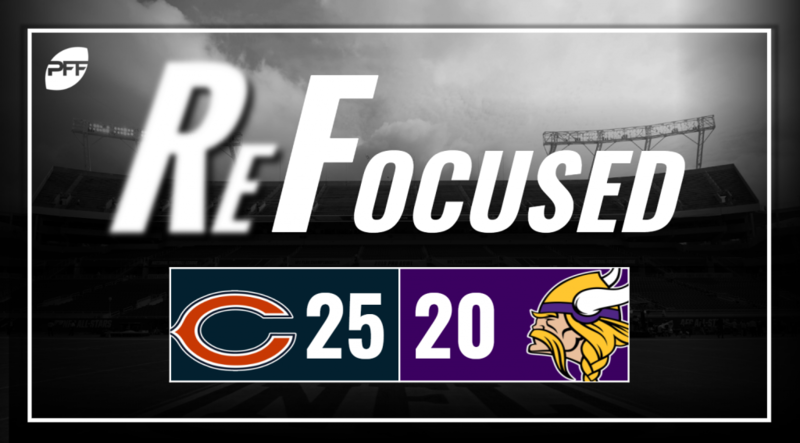 Credit the Bears’ defense and the performance of their front seven for limiting the Vikings’ offense and pressuring Cousins throughout the game.